Beautiful hand colored map of the Canary Islands archipelago. 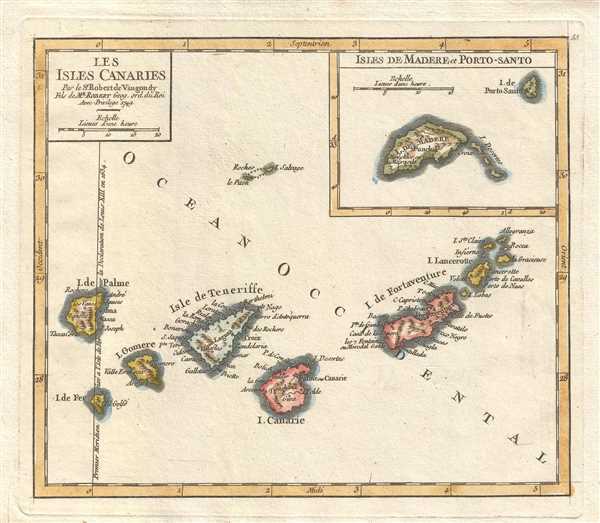 Les Isles Canaries. Par le Sr. Robert de Vaugondy Fils de Mr. Robert Geog. ord. du Roi. This is a hand colored 1749 Didier Robert de Vaugondy map of the Canary Islands. The map depicts the seven Canary Islands, including Tenerife (Isle de Teneriffe), Fuerteventura (I. de Fortaventure), Gran Canaria (I. Canarie), Lanzarote (I. Lancerotte), La Palma (I. e Palme), La Gomera (I. Gomere), and El Hierro (I. de Fer). The Canary Islands are a major tourist destination, welcoming over 12 million tourists every year. Numerous cities are labeled on each of the islands. A meridian is included on the map and runs through El Hierro (I. de Fer), and states, 'Premier meridien fixé à l'Isle de Fer par la Declaration de Louis XIII en 1634' (First meridian fixed to El Hierro by the Declaration of Louis XIII in 1634). An inset map at the upper right corner depicts Madeira Island (Isle de Madere) and Porto Santo Island (Isle Porto-Santo) a Portuguese archipelago and island, respectively. Porto Santo lies to the northeast of Madeira, both of which are northwest of the Canary Islands. This map was published by Gilles Robert de Vaugondy in his Atlas Universel, Portatif et Militaire in the 1749 edition. Robert de Vaugondy, G. Atlas Portatif, Universel, et Militaire (Paris: Vaugondy, Durand, Pissot) 1749. Very good. Blank on verso. Original press mark visible. Pedley, M. S., Bel et Utile, p. 207, 444. OCLC 159770103.